Joann lived with clutter everywhere. Clothes were strewn all over. A stack of dirty clothes in the corner, clean clothes shoved into the closet unfolded. There was even a stack of clothes to giveaway that sat in bags for months. Joann could barely walk in her bedroom without tripping over something. She couldn’t stand the mess. She complained to her friends about how she wanted to do something about it. 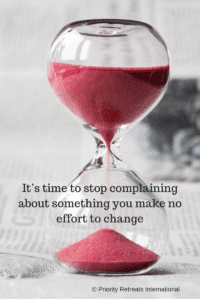 Ever complain to a friend over something you’ve made no effort to change? Yet, Joann took every opportunity to go have fun. She flew to exotic locales going to festivals and concerts but hated coming home to her mess. She avoided the mess like the plague. It wore on her heart. This chaos showed up in other areas of her life, too. She wasn’t willing to let go. The mess was a protective mechanism of sorts. Avoidance was how she handled it. Joann didn’t have to deal with the harsh realities of the other areas of her life she didn’t like either. One thing was true. Joann made no commitment to clean up the mess. Where in your life, do you really want to make a dream come true, yet put forth no commitment to make it happen? It’s time to change that. What would it mean to you to bring that dream to reality? How can you increase your commitment level? What would have to happen to make this a reality? P.S. Want help to implement today’s message? Reply to this email and I’ll set up a 20 minute no offer strategy call to get you moving. This is my holiday gift to you. When I was a kid, I suddenly lost my father to lung cancer. I sank into a deep depression that lasted almost 10 years. Then, one day, I realized life was short and here to be lived to the fullest. I began to explore the world and take on new adventures. I could start to feel all my senses again. I tasted the nectar of an orange. I smelled the scent of a blooming rose. I felt the warmth of the sun on my skin. On that day, when I was 21, I became thankful for what the lost of my father taught me. Because of this experience, I became independent, followed my heart, and took on new adventurers and challenges with ease. Decades later, the Thanksgiving table is still missing someone. Yet, I can be thankful for what the loss taught me. 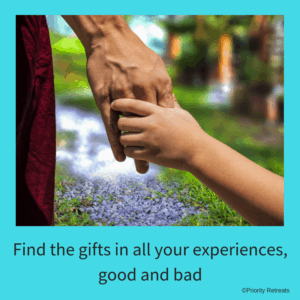 How can you be thankful for the gifts of the not so fun experiences in your life? When we learn the gifts and teachings from these experiences, we realize how blessed we are. In the spirit of this holiday season, be thankful for the abundance that surrounds you (water, shelter, food, clothing) and the life experiences that also made you a stronger person. What’s your commitment level to your dreams? Elliott was considerably overweight and vegged on the couch every night. George noticed Elliott’s health slowly deteriorating and was getting quite concerned that if he didn’t start moving his body that Elliott would probably have a heart attack. Elliott started waking up at 5:00am. He ran every morning before most of the world even heard their alarm clock go off. It wasn’t easy. One morning, he threw his alarm clock off across the bedroom and realized that was the least productive use of his energy. Yet, every day he ran. His mood was better and he felt more energy at the end of the day. This momentum allowed him to easily increase mileage each week and get up every morning. How committed are you to your dreams? Are you willing to go the extra mile? If your dreams have no meaning, you’ll likely find the excuses not to pursue them. And, then when the going gets tough, you stop. 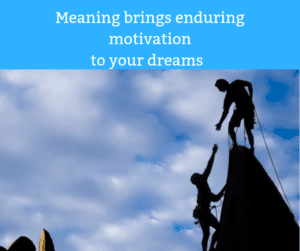 Meaning brings enduring motivation to your dreams. If you never share your dreams, no one will keep you accountable to them. Who will you share your deepest dreams and desires with? It’s your choice how to use these two precious commodities. How you choose to spend the last eight weeks of 2018 is your choice. It’s no one else’s choice but yours. Yours alone. You can’t blame a politician. You can’t blame your boss. You can’t blame your family or friends. 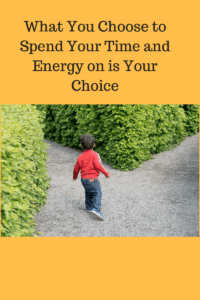 What you choose to spend your time and energy is your choice. Will you take ownership and responsibility in how you use these two precious commodities? If you were to end 2018 on a high note, what two activities will you accomplish or put into motion by then? There is still 56 days left until the end of the year. That’s 1344 hours. That’s a lot of time to achieve a goal. It’s time to take ownership of your time and energy. You choose what foods you consume and drink. You choose the people you associate with. You choose whether to engage in distracting activities or not. You choose whether to exercise or not. You choose how you treat others. You choose how you treat yourself. What will you propel forward in your career, life, and relationships over the next 1344 hours? P.S. Need clarity on what will propel you forward? Reach out to me and we will set-up 30 minutes to get you over this hump. This is not a sales call. It’s my gift to you. A special announcement will be coming your way this upcoming Thursday. Stay tuned!